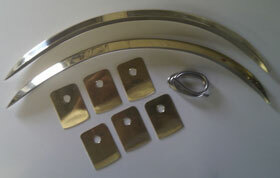 Rare or obsolete vintage Lagonda bodyparts and mouldings, remade! Can’t locate those hard to find or obsolete bodyparts or mouldings on vintage Lagonda’s? maybe we can help. We specialise in making rare brass-work, mouldings and body-parts for a host of vintage cars, including our extensive range for Aston Service Dorset with our bodywork parts for the DB2 cars in particular. If your existing parts are worn, damaged or where even missing we can certainly help whether that’s to make the necessary repairs or to fabricate new pieces. We often have to work with old or damaged original parts, taking templates and measurements which then enables us to think about how we could fabricate the item in small runs, singularly or per order when required. We can currently make the front wing or fender mouldings for a 1948-1953 Lagonda drophead with or without the tabs attached – some customers like to line up the pre-drilled holes on their wings with the moulding and prefer to solder on the tabs themselves we’re entirely flexible. Click here and scroll down the page to see a series of excellent photos of a recently restored 1952 Lagonda drophead which show a pair of original front wing or fender mouldings very clearly (Please note: the mouldings shown on the Gary Porter car are not our mouldings, they’re just the best photos’ I could find! ).